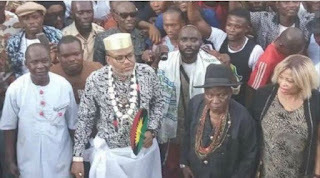 Leader of Indigenous People of Biafra (IPOB), Nnamdi Kanu was reportedly sent far from the castle of Obidiegwu Onyesoh, the customary leader of Nri, a group in Aniocha neighborhood government range of Anambra state, for purportedly violating tradition. Talking with news men in Awka, the state capital on Thursday, Ifeanyi Onyesoh, individual aide to the ruler, said Kanu and his supporters endeavored to compel their way into the royal residence. Onyesoh said Kanu and his wife, Uchechi, and supporters violated the tradition of the town during their visit on July 19 and that the people were angry. Onyesoh said a day before Kanu’s visit, 12 young people came to the palace of Eze Nri requesting an appointment with the traditional ruler. “I was the person that received them and so I told them to go and come back with a written letter so that they will get official reply from the palace since the delegation looked unusual, in that there was no titled person among them,” he said. “At this point, they all left and what we saw the next day was Kanu visiting Nri community with a huge crowd of his supporters. “He (Kanu) went straight to the house of one Chief Shadrack Mbanefo, a subject of the traditional ruler of Nri. “The feelers we later got, was that the said Mbanefo claimed he handed over the `Offo Nri ’, (symbol of royalty) to Kanu, and even allowed Kanu to visit the historic ‘Ohianwehi forest’ revered as ‘forest of life’ by Igbo tradition. Onyesoh said Nri people considered Kanu’s conduct as a taboo because no high profile visitor entered the community without first visiting the traditional ruler, “let alone a sacred place without the knowledge of the ruler”. He said the people regarded Kanu’s action as an affront on their values and so resolved not to sweep the matter under the carpet. 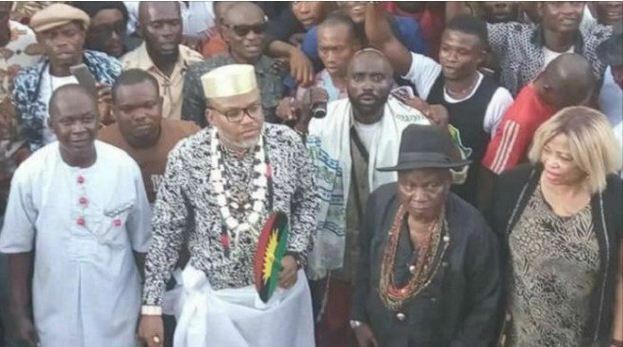 “It is a taboo in Nri and equally against the Anambra state traditional rulers’ council law for a high profile visitor to visit a community without first paying homage to the traditional ruler,” he said. “The people of Nri and her traditional ruler are not against Nnamdi Kanu and his agitation/aspiration but what we cannot take is for Kanu to come and mess up the Nri culture and tradition under whatever motive. “The community will drag him to customary court to ensure that nobody else gives such insult to the community and its heritage. “If Kanu wants a title, Eze Nri is not aware of such aspiration. “If Kanu indeed met with anybody and claimed he was given `Offo Nri’, it means he is seeking the title through the back door and for the title he claimed was given to him by `Adama’ (Mbanefo ), a servant to Eze Nri, is a nullity. “Nri is the ancestral home of all Igbo people and for him to visit Nri in the manner he did means he has no knowledge of Igbo tradition and culture.